Alaska Mine Transformation Centre is one of the most consistent child care ministries Hands of Hope Trust (HOHT) partners with. Pastor Maxwell and his church have forged a relationship with Alaska Mine Primary School in looking after orphans. The school’s responsibility is to identify needy children, provide storage for food handouts from HOHT and offer leadership support. On the other hand the Church ministers to the identified children and offer them a safety net in which they are loved and rehabilitated. In this report we are celebrating the long service of the administrative team, caregivers and the transformation we have seen in three children who have been with the project from its inception in 2009. From left: Beauty, Pastor Maxwell, Gogo Green, Catharine –Pastor Maxwell’s wife- and Mr Matande –School representative. This team has been together since 2012. Gogo Green was the project’s first helper having started work in 2009. In many people’s eyes she is one of the heroines of this struggle. She has lost most of her children and has been left to nurse sick grandchildren alone. The church offered her a helping hand and in return she offers the church her services as a care giver. 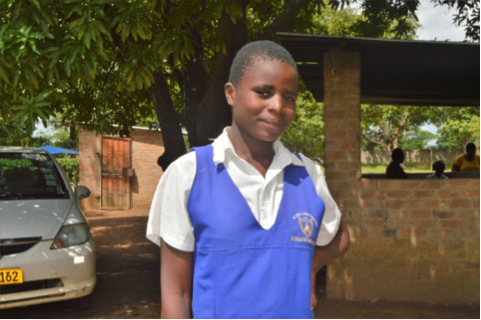 At this point one orphan who was left under her care –Davis – is now at Medical School in Bulawayo. Mr Matande has been a constant figure at our Pastors’ Conferences at Habitation of Hope Camp. He told me that he draws a lot of inspiration from the detailed and faithful teachings he gets at the conferences. He is looking forward to be at habitation in June. Pastor Maxwell and wife Catharine have been the glue that keeps the team together. Gogo Green –Meaning Grandma Green- is loved by the Alaska Children so much. Her service to the project has been constant. The Lord has allowed her to be an ever pouring fountain of love to the kids. She told me one day that in each child she sees her grandchild robbed of parental care. She is working with Beauty –also known as Mai Tadiwa (Tadiwa’s mother) - their partnership is great. Catharine also serves at the Centre as well. Her job is main giving guidance to adolescent girls. We have had the privilege of following the progress of Alice from 2012 when I covered her testimony. In 2012 we were thanking the Lord for taking Alice out of malnutrition. Most people in her community thought she did not have a chance since she was plagued by one sickness after the other. She stated accessing HOHT support when she was in preschool and now she has started secondary education. She is now in Form 1 - 8th year of formal education. She is one of the first children to be helped by Alaska Mine TC. Having been born on 6 June 2005, she is now a teenager. She is one of the girls Catharine is walking with. Joshua also started coming to Alaska TC in 2009. He is from a broken family and he has been living with his mother since he was a child. He has never seen his father and his mother is not sure whether he is alive. The project has not only offered him supplementary feeding but has provided father figures for him. He is now in Form 1 – 8th year of formal education. He was born on 25 November 2002. This means he lost 3 years of schooling due to hardships. He will finish Ordinary Level at 20 instead of 17. In my previous articles on Alaska TC I have covered Greater’s testimony in detail. She is Gogo Green’s grandchild from her deceased daughter. She was left under Gogo’s care as a sick baby. She has been making tremendous progress in health and school. She is celebrating her 16th birthday of the 19th of May this year. We praise God for bringing hope to Gogo and Greater through Alaska TC and HOHT.